The three-term Democrat drew the most challengers she’s ever faced. 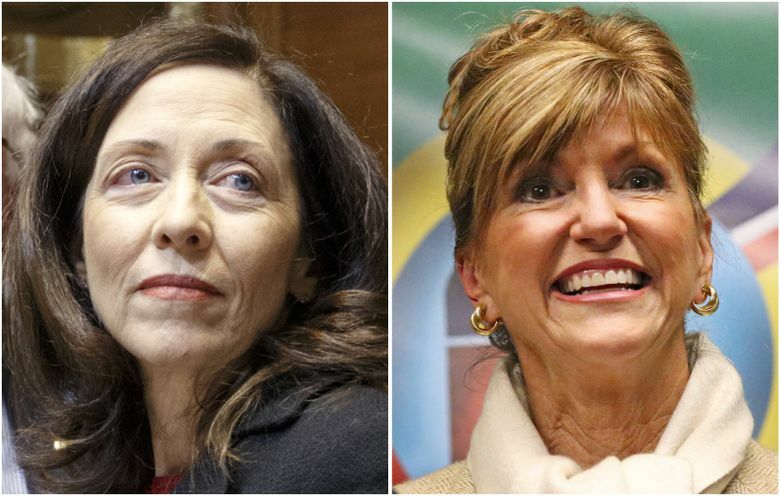 The most familiar name is former state Republican Party chair Susan Hutchison, who argues the sheer number of candidates shows a lack of support for Cantwell. U.S. Sen. Maria Cantwell is up against a thicket of opponents on the Aug. 7 primary ballot. The three-term Democrat drew 28 challengers, the most she’s ever faced. It’s a mostly little-known roster that includes 13 Republicans, four Democrats, five independents, a Libertarian, a Freedom Socialist, and others. The most familiar name is former state Republican Party chair Susan Hutchison, who argues the sheer number of candidates shows a lack of support for Cantwell. “We wouldn’t have this crowded ballot if Maria Cantwell weren’t vulnerable,” said Hutchison, a former TV news anchor who ran unsuccessfully in 2009 for King County Executive. Hutchison, 64, said Cantwell has been an ineffective “ghost” in the Senate who only wakes up when it’s time to run for re-election. “You can ask anybody out there. She wins an election and goes into a five-year nap,” Hutchison said. Cantwell, 59, laughed off that attack in an interview, pointing to a list of accomplishments, such as long-sought reforms to federal wildfire spending and a $3 billion boost to the federal Low Income Housing Credit for affordable housing. She was chief sponsor of legislation signed into law last year that strengthened tsunami research and warning systems. “I am very proud of our record working hard for Washington state. I think we’ve been a successful legislator in both Democrat and Republican administrations,” Cantwell said. Cantwell was elected to the Senate in 2000, defeating Republican incumbent Slade Gorton. She spent more than $10 million of her own money on that race — cash earned as a tech executive with RealNetworks. She had previously served six years in the state Legislature and was elected to the U.S. House in 1992, losing the seat two years later amid a Republican wave. Like most Senate Democrats, Cantwell has largely resisted the agenda of President Donald Trump and majority Republicans, including efforts to dismantle the Affordable Care Act. Cantwell has voted for Trump-favored policies just 25 percent of the time, putting her about in the middle of the pack of Senate Democrats, according to the data journalism site FiveThirtyEight.com. “Every day you wake up and there is another thing he is trying to undermine,” Cantwell said. She has tangled with Trump appointees, including Interior Secretary Ryan Zinke’s efforts to raise fees for national parks and open up more public land to oil drilling and mining. Recently, Cantwell has taken some heat for proposing to allow the shooting of up to 900 sea lions a year on the Columbia River in an effort to protect threatened salmon. Cantwell does not support another option suggested by some scientists: breaching four lower Snake River dams to restore fish runs. Cantwell said she has grave concerns about Brett Kavanaugh, Trump’s nominee to the U.S. Supreme Court, including his stances on abortion rights and the limits of executive power. Hutchison said Cantwell’s criticisms of Kavanaugh are evidence she’s an ideologue. Hutchison said that line was disrespectful to Trump and millions who voted for him. “To me it’s just a very extreme point of view … we can’t have people talking like this,” she said. As state GOP chair, Hutchison supported Trump in 2016. She made national news when she confronted Texas Republican Sen. Ted Cruz at the Republican National Convention in Cleveland, blasting him as a “a traitor to the party” for failing to endorse Trump in his convention speech. Hutchison also says she’s for term limits for Congress, perhaps two or three terms for senators. Since entering the race at the last minute before the May 18 filing deadline, Hutchison has raised more than $540,000 — much more than any other challenger, according to Federal Election Commission (FEC) filings. That’s still far behind Cantwell, who has raised nearly $10 million for her campaign, with more than $5 million in the bank through mid-July, according to the FEC. Among other challengers in the race is Seattle Police Capt. Keith Swank, who is running as a big supporter of Trump. He calls Hutchison an establishment figure. Swank, a 28-year veteran of the Seattle Police Department who currently commands the night watch, cites illegal immigration as a top concern. While Swank said he follows the policies of the city when at work, he doesn’t personally agree with Seattle’s status as a “sanctuary city” that resists aiding federal immigration authorities. “The truth is Democrats want the illegals here to be given amnesty because they know that most of the illegals will vote for them,” Swank says on his campaign website. In 2011, Swank, then a sergeant, was suspended for 10 days without pay for a 2010 incident in which a gang detective threatened to beat the “Mexican piss” out of a Latino man detained in a robbery investigation. Swank was the ranking officer on the scene and was faulted for a lack of appropriate supervision. The man who had been detained was released when police determined he had no role in the robbery. The city later paid $150,000 to settle a civil lawsuit over the matter. In an interview, Swank disputed the city’s findings against him. He said he later challenged the discipline and was paid for seven days of the 10-day suspension. Another Republican candidate in the race is Joey Gibson, the Southwest Washington organizer of Patriot Prayer, a controversial group known for organizing protests that have ended in violent clashes with antifa counterprotesters. Gibson’s website focuses on personal freedom and says the U.S. should abolish all taxes, to be replaced by a flat tax. Another Republican, Art Coday, is a doctor who placed third in the 2012 Senate primary. He supports complete repeal of the Affordable Care Act. Dave Bryant, also a Republican, is a former Navy commander and Boeing employee who emphasizes reduced government spending in order to pay down the national debt. Independent candidate Jennifer Gigi Ferguson has worked as a chemical-dependency counselor and is calling for single-payer health care. Also making another run are perennial fringe candidates, including “Goodspaceguy,” a loser of 18 previous elections who favors free markets and construction of orbital space colonies. So far, national political prognosticators are rating Cantwell’s election prospects as safe.